This feature allows you to take any text you have sent in the past or you create and save it as a template to use in the future. You can create a template even if you don’t send the text to the lead at that time. Step #1 – When you are ready to create your template click the “Save as template” link. Step #2 – Name your template and click “Save” button. Step #3 – Open the “Text Templates” section, you will now see your new template is available to use in the future. At anytime you can click the “+” icon to use the template or click the trash icon to delete the template. To edit a template just load it by clicking the “+” icon then make your changes and save it as a new template, then just trash the old version. By Adding merge tags to your text message templates you can have the system automatically personalize your text to your recipient. Click the “Tag” icon to get our list of tags and apply the ones you want to use. With “Text Templates” You can now send your follow up texts without having to write them every time. 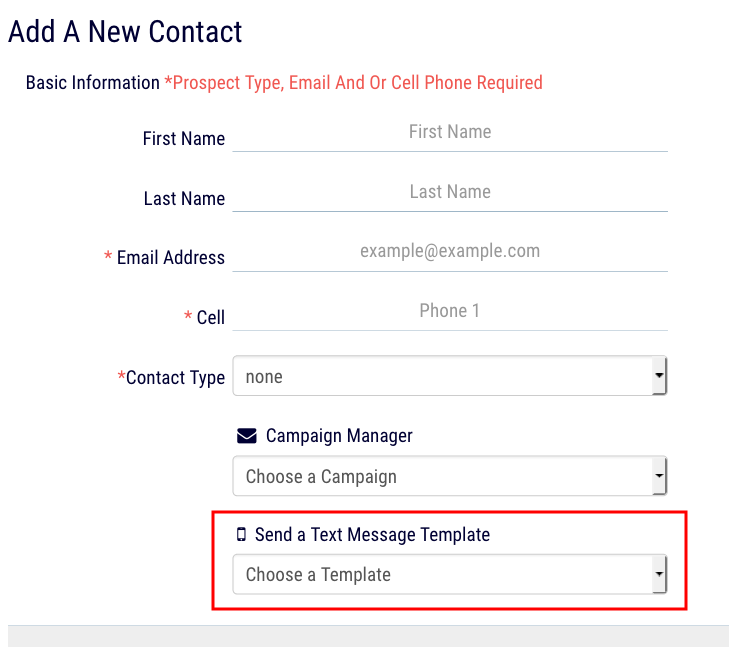 When you add a single lead to the system you will see a dropdown to instantly send any template you want to your new lead.